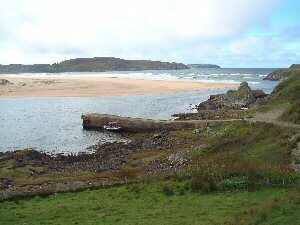 Bettyhill lies on the east side of the mouth of the river Naver and has a small pier. The village is possibly named after Elizabeth, (Countess of Sutherland who died in 1939). It grew as a settlement in the early 19th century when many tenants of the Duke of Sutherland were evicted from their inland straths to crofting plots on the coast. The jetty was used as the base for a sweep net fishery for many years, only ending in 1992 as a conservation measure. On one day in 1962 almost 1000 salmon were caught. The jetty is no longer used commercially but the occasional leisure craft will use it for short periods. The old photo (see 'More Photos') was taken in 1923 (credited to the Bettyhill Hotel).